Maine; and Schenectady, New York. Within these organizations, Navy experts will apply their experience, and use some of the world's most modern equipment, to create a state-of-the-art propulsion system that is versatile, quiet and highly efficient. 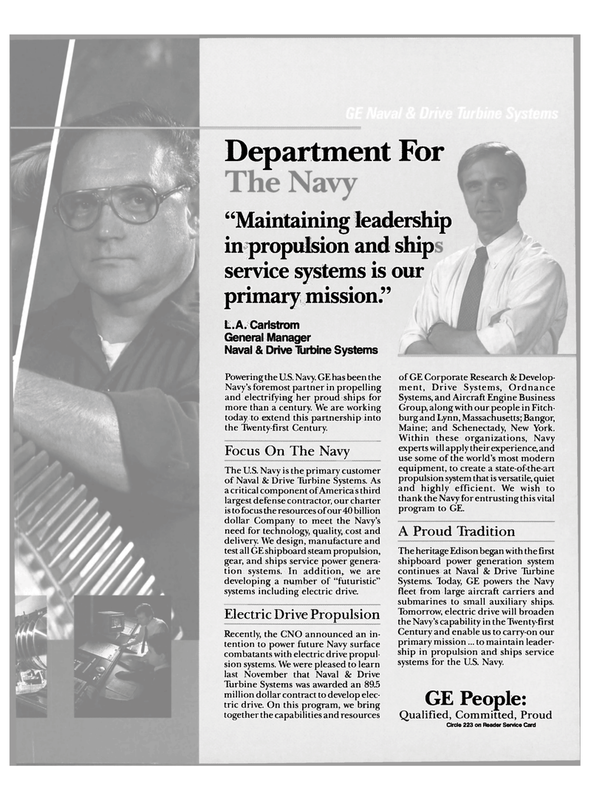 We wish to thank the Navy for entrusting this vital program to GE. Systems. Today, GE powers the Navy fleet from large aircraft carriers and submarines to small auxiliary ships. Century and enable us to carry-on our primary mission... to maintain leader- ship in propulsion and ships service systems for the U.S. Navy. The U.S. Navy is the primary customer of Naval 8c Drive Turbine Systems. As a critical component of Americas third largest defense contractor, our charter is to focus the resources of our 40 billion dollar Company to meet the Navy's need for technology, quality, cost and delivery. We design, manufacture and test all GE shipboard steam propulsion, gear, and ships service power genera- tion systems. In addition, we are developing a number of "futuristic" systems including electric drive. Navy's foremost partner in propelling and electrifying her proud ships for more than a century. We are working today to extend this partnership into the Twenty-first Century. Department For "Maintaining leadership in propulsion and ship service systems is our primary mission."